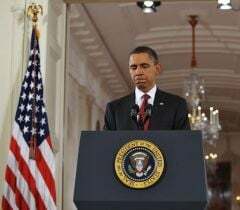 Obama exploited a captive audience of 3,000 soldiers assembled at the largest US Army base in the world as part of a cynical attempt to use the withdrawal of US troops from Iraq, which is to be completed by the end of this month, to promote his own reelection campaign. The reality is that the withdrawal of America’s armed forces from Iraq is not the deliberate outcome of US policy, but rather the unavoidable result of Washington’s failure to negotiate a new Status of Forces agreement to permit the administration’s favored plan, which was to leave behind as many as 20,000 troops. That failure was based on the refusal of the Iraqi government, and indeed all of the major political forces in the country, to accede to Washington’s demand for blanket immunity for US troops from Iraqi law. Mass popular opposition, based on the bitter experiences of the Iraqi people over nearly nine years of US occupation, with all of its death and brutality, made any such agreement impossible. Even as Obama used the Fort Bragg speech to wrap himself in the American flag and associate himself with the US military—he referred to himself as “commander-in-chief” three times, while his wife Michelle introduced him to the military audience by that title—he sought to promote the illusion among his liberal Democratic base that the withdrawal represents the fulfillment of a 2008 campaign pledge. This is a bare-faced lie. Obama won the 2008 election in large measure due to the deep-going hostility among the American electorate to the wars begun under the Bush administration. He pledged to end the war in Iraq within 16 months of coming to office. Once in the White House, however, he retained Bush’s secretary of defense, Robert Gates, and largely ceded policy decisions to the Pentagon brass. The December 31, 2011 deadline for completing troop withdrawals was set not by Obama, but was rather part of the Status of Forces Agreement reached between Bush and the Iraqi regime in 2008. Bush, like Obama, had fully intended to renegotiate this pact to allow permanent stationing of US troops in the country. As it is, Washington is doing its best to maintain its grip on Iraq, replacing uniformed troops with an army of up to 17,000 under the nominal direction of the US State Department. It is to include a force of 5,500 private mercenary security contractors, a massive CIA station, and Special Operations troops operating covertly out of uniform. Tens of thousands of US troops are being kept in place across Iraq’s border in Kuwait and elsewhere in the Persian Gulf, while the US Navy and the US Air Force remain in control of the country’s coastlines and airspace. US imperialism remains poised to intervene once again in the country, even as it engages in unceasing saber-rattling against its neighbor, Iran. Obama’s hailing of “the end of the war in Iraq” may prove decidedly premature. Obama’s speech, which included no hint of his own supposed opposition to the Iraq war, was filled with empty rhetoric—such as, “there is something profound about the end of a war that has lasted so long”—meant to obscure and falsify what the war was all about. He sought to portray it as a crusade for democracy and the liberation of the Iraqi people. “We remember the early days—the American units that streaked across the sands and skies of Iraq: the battles from Karbala to Baghdad,” said Obama, as if recounting some heroic exploit. In reality, the “early days” were the days of “shock and awe,” when massive US bombardments killed civilians and largely defenseless Iraqi troops alike in an unprovoked attack on an oppressed and impoverished country. “We remember the grind of the insurgency,” he added, declaring that the will of the troops “proved stronger than the terror of those who tried to break it.” Here one has the inevitable and time-worn rhetoric of colonialism. Those resisting the foreign occupation of their country are “terrorists,” while occupiers are endowed with the supreme right to impose their will. “We remember the specter of sectarian violence,” he continued, telling the troops, “in the face of ancient divisions, you stood firm to help those Iraqis who put their faith in the future.” One would never guess that the bloody carnage and ethnic cleansing had itself been unleashed by the US invasion, the destruction of the Iraqi state, and the deliberate promotion by Washington of sectarian divisions as a means of conquering the country. Missing from this narrative was any reference to the cost that the US war imposed on its unwilling victims, the Iraqi people. According to credible estimates, these costs include a million Iraqi lives. Some four million people were driven from their homes, forced to flee the country or become internal refugees. Basic infrastructure was smashed, leaving masses of the population without adequate access to electricity, clean water and other basic necessities of life. A country of 30 million has been left with 4.5 million orphans, some 600,000 of them living in the streets. There are an estimated 1.5 million widows in the country, 10 percent of Iraq’s female population. The poverty rate has risen from 15 percent before the war and occupation to 55 percent today, with a quarter of the population living in extreme poverty. The United Nations gives the unemployment rate at 28 percent, while others suggest that the share of the population without real jobs is closer to 50 percent. Meanwhile, lethal violence continues, with an average of 243 Iraqi civilians killed in each of the first six months of this year. On the day Obama delivered his speech at Fort Bragg, just the initially reported incidents of bombings in Baghdad and Ishaqi and shootings in Mosul and Fallujah killed at least 11 people, leaving many more wounded. What is perhaps most stunning about what is being billed as Obama’s keynote speech on the end of the Iraq war is his complete inability to present even the semblance of a coherent explanation of why the US went to war in the first place. This is all nonsense and lies. Do the White House speechwriters really expect anyone to believe that 170,000 American troops were deployed in Iraq to give Iraqis “a chance to forge their own destiny” with no thought for the 112 billion barrels of oil within the country—the second largest proven reserves in the world? America’s ruling elite in the 21st century embarked upon naked colonial-style wars aimed at imposing US hegemony over the world’s key energy producing regions of the Persian Gulf and Central Asia. As for delivering “justice” to those who attacked the US on September 11, 2001, there is no record of anyone allegedly involved in these attacks having come from Fallujah or Basra, where Al Qaeda had never been heard of before the US military invaded Iraq. Obama merely recycles some of the old lies of the Bush administration, while wisely skipping over the principal pretext given to the American people for the war: an imminent threat from Iraqi weapons of mass destruction that did not, in fact, exist. As Obama gave his speech at Fort Bragg, thousands of Iraqis demonstrated in the streets of Fallujah, scene of the bloodiest US sieges of the war in 2004 and 2005, which claimed thousands of lives and left virtually the entire city of half a million people in rubble. The demonstration was called as a “festival to celebrate the role of the resistance” in forcing an end to the US occupation. Demonstrators carried photographs of friends and relatives killed in the American offensive as well as placards bearing slogans such as “Now we are free” and “Fallujah is the flame of the resistance.” Others burned US flags. In his cynicism, Obama may think that the American people do not remember how the US got into Iraq. He may reassure himself that they have no alternative in any case, given that both Democrats and Republicans are fully implicated in this criminal war of aggression. The lying and glorification of the Iraq war—which gave the world the horrors of Abu Ghraib, the siege of Fallujah, the massacre in Haditha and countless other war crimes—is not just a matter of electoral calculations. Obama is compelled to defend this war because its original aims—the use of military might to offset the decline of American capitalism through the armed occupation of the world’s key energy producing regions—are still pursued by the US ruling elite. With all the talk about the ending of a decade of war, the downward spiral of US and world capitalism is creating the conditions for global military conflagrations that will eclipse the crimes committed by American militarism in Iraq.